You are here: Home / Blog / Did Winter Damage Your Vinyl Siding? How Did Your Siding Do This Winter? Ohio winters damage siding more frequently than you think. Winters aren’t kind to most anything, but they’re particularly damaging to your house. In our state, like most of the Northeast, we experience deep freezes followed by abrupt thaws. This is a huge issue for your house, however, as all of the exterior materials are subject to this cycle. When ice and snow lay siege to your home and melt, the moisture will find any small cracks and settle into them. When another cold spell hits, the water will freeze and expand, creating a larger crack or hole in your siding. This process repeats many times during Ohio winters. Whether you can notice the hole or not, it’s best to have a professional examine your home after winter. 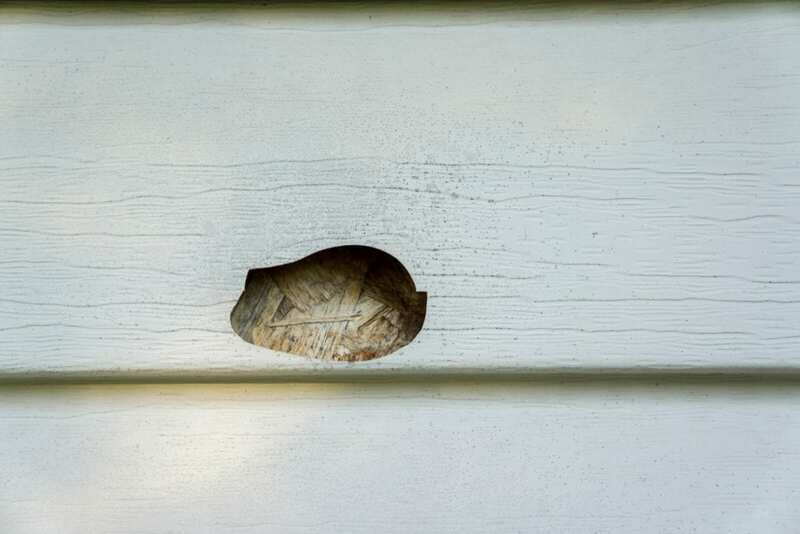 The main reason you should do this is because even the tiniest hole in your siding – one of your home’s main defenses against the weather – can cause severe damage with relative speed and intensity. How Can I Tell If My Siding Is Damaged? You can take a walk around the perimeter of your home in the daylight first, if you like. This will likely catch any larger cracks or holes in your siding. If you notice significant cracking or missing siding, you need to call a professional right away. After all, the larger the area exposed to the weather, the faster the interior materials may decay or sustain other kinds of damage. If you can see the hole or crack from the street, you need to call someone immediately. If you don’t notice any damage from the ground level, it’s still wise to call a professional. The smaller cracks and holes in your siding are still allowing moisture to seep into your home. The earlier you catch these minor imperfections, the less likely you will need to prematurely replace your exterior materials. Or worse: These small cracks could lead to you performing major repairs on the stuff behind the siding. Trust me, this becomes expensive, fast. The absolute best way to know for certain is to invite a local sidindg contractor out to your home to assess the state of your siding. Under the constant duress of winter’s freezing temperatures, vinyl will become brittle. There’s nothing to prevent this from happening; it’s just the natural way of things. When it becomes brittle, it’s more susceptible to cracking. These brittle, cracked parts of your siding cannot be repaired. They can only be completely replaced. And if one area of your home’s siding is brittle, chances are the same rings true for all of the siding. When you notice this, you will want to get an expert opinion about how to proceed. If left unattended, the cracks will not only pose a threat to underlying materials, but also contribute to energy loss. The cracks in your siding will allow heat to escape, resulting in higher energy costs for you and your family. You need insulated vinyl siding. Wood siding is protected by a thin layer of lamination, which helps to repel moisture and protect the wood. However, heavy snowfall can result in this lamination peeling away, exposing the materials to the damaging weather. When wood is exposed to moisture, as we all know, it causes it to rot. And rot spreads. If you notice the laminate wearing away or see a section of your wood siding in the beginning stages of rot, you need to call a licensed contractor to assess the damage. Rotting wood siding won’t only expose the underlying materials to damage, but also your home’s roof, interior, and even its basic structure. To avoid costly issues in the future, it’s best to have your wood siding inspected as soon as possible. Especially after a harsh winter, in the aftermath on conditions that possibly destroyed the waterproof laminate. If you find your siding needs painted more often than every decade or so, then this is actually your house’s cry for help. Listen to it before it gets worse. In most cases, it’s a sign of moisture sitting behind the siding, which means the damage is likely already within your walls. This is also a good indication that your siding needs replaced, because it is no longer performing one of its primary functions – to protect your home from moisture. If you notice peeling paint within your walls – in your living room, kitchen, bedrooms, etc. – then this is likely a sign of structural problems taking root. Call a licensed contractor immediately to examine your siding for any possible breaches that could pose a risk to your house. My Energy Bill Keeps Going Up! If you’re noticing a rising trend in the electricity or gas bill lately, then your siding may be to blame. When you haven’t replaced your siding in a while or it has taken damage from a recent storm or rough winter, it can lose its efficiency. Regulation of temperature inside your home significantly depends on the condition of your siding. Any kind of damage, whether through wear and tear or age, can affect its ability to maintain that function. Why Choose Columbus Windows & Siding? With an A+ rating with the Better Business Bureau and an A rating on Angie’s list, supporting this local business never disappoints. We’ve helped many people find solutions to their siding needs after a particularly damaging winter – we can help you, too. In both 2017 and 2018, we’ve won the Best of Houzz award. This is only bestowed upon home improvement and remodeling businesses that are customer-focused. We won this award by the vote of over forty-million homeowners. In addition to these qualifications, Columbus Windows and Siding is also a VSI certified company. We are licensed, bonded, and insured, so you know you’re protected when you choose usAs a certified contractor we receive ongoing training directly from manufacturers, so you know your siding is installed correctly! We’re dedicated to providing the absolute best service for each of our clients, whether it’s a simple roof inspection or an all-over update of their roofing, siding, gutters, and windows. Drop us a line today and let’s make sure your siding is good to go for the summer.